Chef Jim Thomlinson's London Mess now run the kitchen at The Dissenting Academy in Newington Green, and have plenty of great food events going on (as well as some amazing roasts on Sundays). To celebrate Chelsea Flower Show they are cooking a special 'Feast of Foliage' a four course banquet with a focus on edible flowers, as well as lots of meat and fish. Sounds amazing! "London Mess, the new venture from inventive chef Jim Thomlison is celebrating Chelsea Flower Show with it’s own unique spin. His ‘Feast of Foliage’ will focus on the type of urban plants commonly seen around his base at the Dissenting Academy in Stoke Newington and never seen at Chelsea Flower Show! For example both dandelions and borage will be served as part of this extreme food art experience, an event guaranteed to pleasure both the taste buds and eyes. With unique surprise touches to be revealed on the night, the four courses will be served on huge platters for guests to share, creating scenes reminiscent of a Tudor banquet with huge cuts of meat and whole fish served in the middle of communal tables. 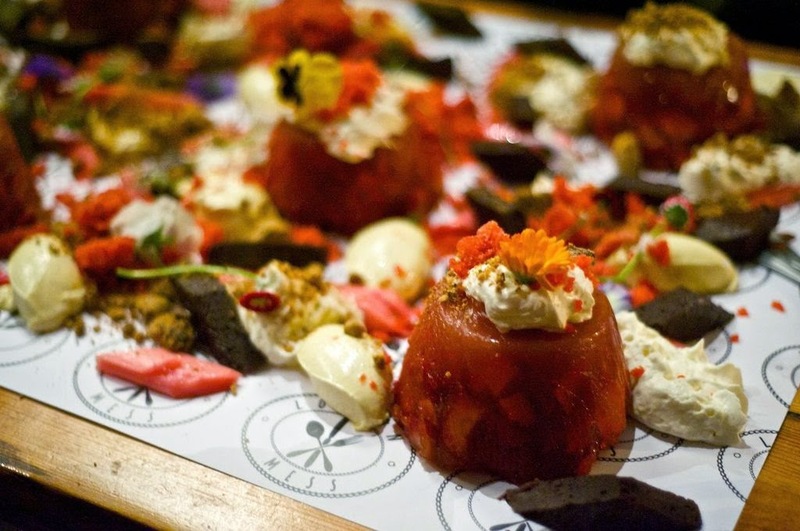 Ending the meal will be one of Jim’s trademark showstopper desserts… made on the table in front of the guests and overflowing with fresh edible flowers and weeds this is a truly indulgent way to end a meal that never fails to delight."